Homemade blueberry syrup is a delicious, nutrient-rich topping for pancakes. Blueberries are rich in potassium, vitamins C and K and manganese. In contrast, maple syrup -- a traditional pancake topping -- contains more sugar and calories and has only trace amounts of vitamins. Non-maple pancake syrups often include high fructose corn syrup and many artificial ingredients and preservatives. Preparation of a berry-based pancake syrup at home is relatively easy, and it results in a flavorful, healthful alternative to conventional syrups. Rinse and dry 2 cups of fresh blueberries, taking care to remove any stems that are still attached to the berries. Discard any berries that are green or overripe. 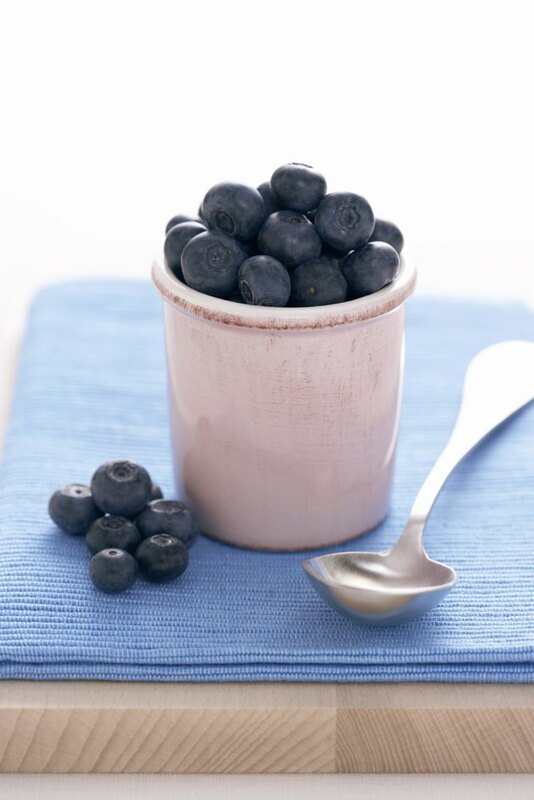 Place the blueberries and 3/4 cup of water in a medium saucepan and crush most of the berries with a potato masher. Allow some berries to remain whole to add to the syrup's texture. Add 1/2 cup of honey and the juice from half a lemon to the the blueberries and water. Stir with a spoon to combine the ingredients. Bring the mixture to a boil. Simmer the blueberry mixture for 10 minutes, stirring frequently. The syrup will darken and thicken slightly as it cooks. Pour the blueberry syrup into a serving pitcher and drizzle over pancakes. Refrigerate leftover syrup in a covered container for up to one week. Strain the blueberry syrup through a sieve prior to pouring it into the pitcher if a smoother-textured syrup is preferred. Reserve the blueberry chunks left in the sieve for other recipes.